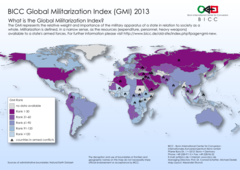 The Global Militarization Index (GMI) 2013 shows that the Middle East continues to be the most highly militarized region in the world. Experts of BICC (Bonn International Center for Conversion) point out that Asia, too, is demonstrating a particularly strong trend towards regional rearmament. With Israel, Syria, Jordan and Kuwait, four countries in the Middle East are in the Top 10 of the GMI. This reflects the high level of militarization in this region, which is so rich in conflicts. Furthermore, all the other states in the region, with the exception of Qatar, are listed among the GMI’s Top 40. “This high level of militarization, together with general rearmament projects involving arms imports from all over the world, is contributing to a further destabilization of the area and can lead to the use of violent means to resolve internal as well as external conflicts, as in Syria”, Jan Grebe, researcher at BICC, comments the results of the GMI. Yet, certain European countries such as Russia and Cyprus also continue to assert their positions in the TOP 10. Cyprus’s regular place in the top set is due primarily to the conflict between the island’s Greek and Turkish population groups, which has continued unresolved for decades. Whereas Azerbaijan has already ranked high in previous years, Armenia is a new entrant this year. (Since 2013, the data for Armenia also includes reservists, which is why the country now ranks considerably higher than in previous years.) The rapid build-up of military capacities in the Caucasus is accompanied by heated diplomatic rhetoric and the risk of rekindling the long-term military conflict over Nagorno-Karabakh. “The scale of rearmament in the Middle East is unparalleled,” Jan Grebe underlines. Israel (GMI: 1st place) and the Arab states of Syria (GMI: 5th place), Jordan (GMI: 6th place), Kuwait (GMI: 10th place), Oman (GMI: 11th place), and Saudi Arabia (GMI: 13th place) are among the most militarized countries in the region. This high level of militarization is demonstrated among other things by the ratio between military expenditure and Gross Domestic Product, which is well over seven percent in some states in the region and thus far in excess of the world average of approximately 2.5 percent (by comparison: the figure for Germany is approximately 1.4 percent). Military expenditures in the Middle East show a clear upwards trend. In 2012, they amounted to US $128 billion, while in 2000, they came to US $80 billion—a remarkable increase of 60 percent. The rising militarization in this region is taking place against the background of various unsolved territorial conflicts, mutual security threats and rivalries between individual states. Although the ratio of military expenditure to Gross Domestic Product is moderate in most countries, military expenditure has nevertheless risen considerably in absolute terms. All in all, expenditure on the continent amounted to US $382 billion in 2012. This compares with US $202 billion in 2000, an increase of 89 percent. "At the same time, many states increase their weapons acquisitions, which is particularly visible in the modernization and the expansion of the naval forces," Jan Grebe explains.